When fossil remains of dwarf elephant or dwarf mammoths were found in the Mediterranean basin, these remains were once usually attributed to trade. Two groups of remains of dwarf elephants have been found on the island of Tilos. Since no migration route between the any other island can be proved, the species should be named Tilos Dwarf Elephant (Elephas tiliensi). It was the latest paleoloxodontine to survive in Europe. They didn't become extinct until around 4000 BC, so this elephant survived well into the Holocene and thus was alive during the the start of the Egyptian civilisation. 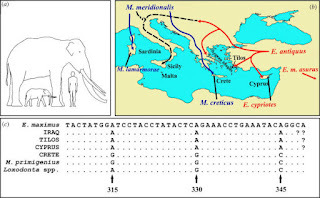 The Tilos dwarf elephant is the first dwarf elephant whose DNA sequence has been studied. The results of this research are consistent with previous morphological reports, according to which it is more closely related to Elephas than to Loxodonta or Mammuthus. 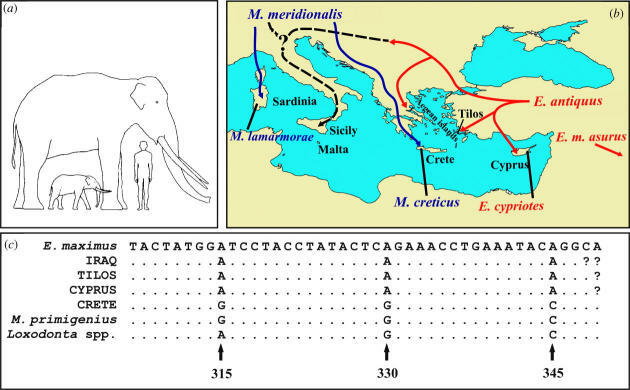 The most recent research confirms that the origin of the Tilos and Cyprus elephantids is consistent with a lineage within the genus Elephas, while the DNA-sequence from the Cretan sample falls clearly within the mammoth clade. Thus, the scientific name of the Cretan Dwarf Mammoth Mammuthus creticus rather than Elephas creticus, seems to be justified for this form.